Olecranon bursitis is an inflammation of the bursa located at the rear of the elbow. The bursa is swollen and painful as a result. The condition is also referred to as "student's elbow". 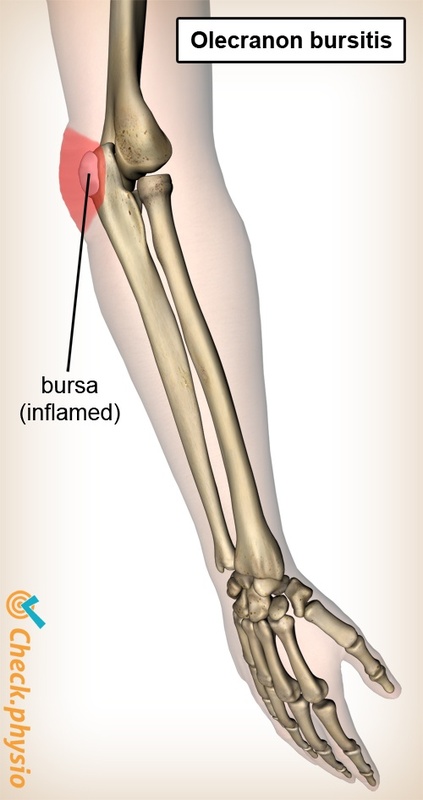 A bursa is a type of bumper cushion that covers protruding bone sections. It absorbs pressure forces or ensures that bones, tendons and skin move over each other smoothly. The bursa located at the rear of the elbow is called the "olecranon bursa". This becomes inflamed (bursitis) and swollen. Fluid accumulates in the bursa, which is clearly visible at the rear of the elbow. An olecranon bursitis usually occurs as a result of someone bumping their elbow or leaning on it for prolonged periods. However, it can also occur without any obvious cause. Swelling at the rear of the elbow. Initially this swelling is not clearly visible, but at a later stage it can form a significant lump. Leaning or pressing on the bursa is painful and makes the bursitis worse. Complete flexing of the elbow can be painful, because the skin over the bursa is pulled tight. The elbow must be rested until the bursitis has disappeared. Pain relief, anti-inflammatories and ice packs can reduce the symptoms. The swollen bursa can be pierced by a specialist to drain the fluid.